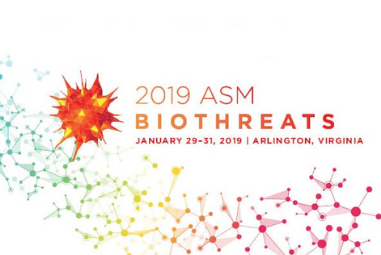 March 27, 2019 -- “What’s the first thing you think of when you hear Ebola?” asked speaker John Dye, PhD, of the U.S. Army Medical Research Institute of Infectious Diseases at the American Society for Microbiology’s (ASM) Biothreats conference, held during the last week of January in Arlington, Virginia. Ebola was one of the most talked about high-consequence pathogens at the event. However, the discussions were not somber but rather inspirational, focused on learning from past outbreaks in order to inform novel ways to approach detection and prevention of Ebola, as well as other pathogens and toxins. Speakers at the conference covered everything from the largest Ebola epidemics, to the policies in place to enforce biosecurity, to the newest technologies to detect minute amounts of ricin and abrin toxins, and much more. Keynote speaker Anne Schuchat, MD, principal deputy director of the Centers for Disease Control and Prevention (CDC), touched on what was learned from the four largest epidemics of Ebola (the 1976 and 1995 epidemics in Zaire, the 2014 pandemic in Guinea, Sierra Leone and Liberia, and 2018 outbreak in the Democratic Republic of Congo). She explained that most of these cases of Ebola were nosocomial (originating in the hospital), and that health care workers were most impacted, due to use and reuse of needles for vaccines, lack of gloves, scarcity of detection or prevention methods and improper burial practices. Her speech was followed by many sessions that touched on how high-consequence pathogens can have an even greater negative impact when coupled with lack of diagnostic tests, which directly impacts the ability to contain the outbreak. What makes these detection and diagnostic devices so important? First responders to any outbreak should be able to quickly and correctly assess the pathogen or toxin exposure in order to take the appropriate next steps. Some of these new devices enable a positive or negative reading directly in the field. The ability to give this objective reading means that first responders do not need to be trained to read results of in-field diagnostic tests to allow the best point-of-care treatment. Listed below are several portable/in-field biothreat detection technologies that were highlighted at the conference. Tetracore held a session to provide an overview of the capabilities of its BioThreat Alert Multiplex Strips for testing for biological toxins and bacteria, which are used in conjunction with the handheld BioThreat Alert TX Flex Reader. The strips, based on a lateral flow assay, can screen for the presence of up to 5 targets in 1 environmental sample per test. With only about 0.12 mL of sample required per test, the strips can produce results in 20 minutes.